I’m going to be real here, you probably won’t like me after you read this post. Because I’m about to tell you that what you have been doing for many years is pointless. And sure, maybe you won’t believe me, but I wish someone had told me this when I was doing exactly what you are doing now. 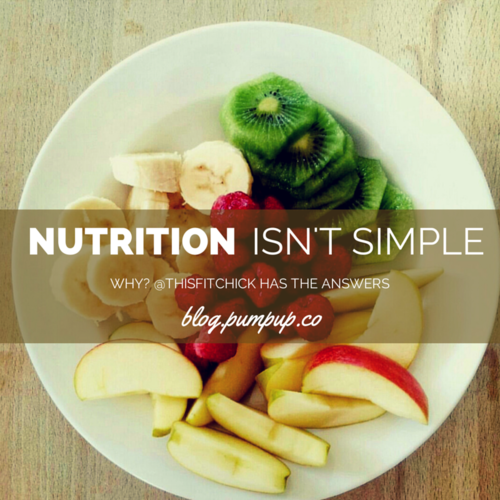 Eating/nutrition is not simple. You look in the latest magazines for healthy eating tips, you mark ‘health’ as a topic of interest on stumbleupon to get the latest flat belly tricks, you follow fitness pages for a ’2 week detox diet to lose 10 pounds’… you get what I mean here. It’s not as simple as switching from regular soda to diet soda. It’s not as simple as using fat free milk in your coffee over 2%. It’s not as simple as drinking fruit smoothies for 5 days straight. It’s not as simple as not eating carbs past 6pm. In fact, these little tips and tricks (which in fact are usually full of crap and backed by no/little science) are making nutrition much more complicated. 2. Food is comprised of fat, carbohydrates and proteins. Fruit has sugar, cocoa puffs have sugar, at the end of the day, sugar is still sugar and the body will metabolize it as such. That’s it. You need to just eat food. By eating food, you will get your daily protein, carbs and fat. Track these to fit your daily amounts and you are golden. Well, it is, but the practice takes time. It takes trial, it takes error… it takes patience and persistence… and that is not so simple. So, as easy as it is to fall for these simple tricks you read about, you actually make the situation so much more complicated by combining all these crap tips and tricks and hoping for a quick outcome. I’m sorry, but it just doesn’t work like that. Nutrition isn’t just about some fad diet, or some quick fix. Long term health and results comes from guidance, patience and work. Stop making it seem so simple and get to work!